Our new North American Vocation Team invites you to contact them! 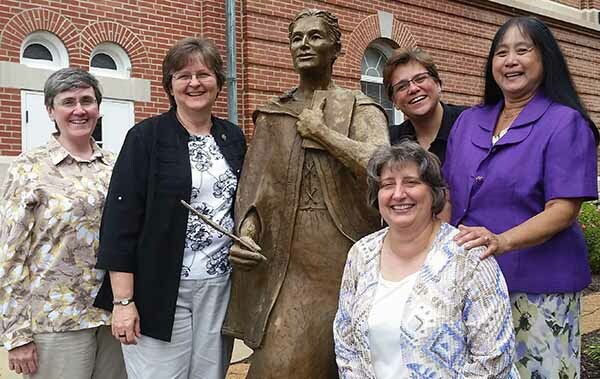 Pictured with the sculpture of SSND Foundress Blessed Theresa Gerhardinger on our St. Louis campus are, from left, Sisters Nancy Gilchriest, (ngilchriest@ssnd.org), Mary Kay Brooks (mbrooks@ssnd.org), Bridget Waldorf (bwaldorf@ssnd.org), Rebecca Tayag (rtayag@ssnd.org) and (kneeling) Stephanie Spandl (sspandl@ssnd.org). Meet the Members of our Vocation Team! For Sister Nancy Gilchriest, – who professed vows 28 years ago – the SSND pin still holds special meaning. Sister Mary Kay Brooks considers her call to religious life a mystery that is still unfolding. Sister Stephanie Spandl recalls how God led her to the place where the deepest desires of her heart – to serve God and serve God’s people – could best be lived out. Sister Bridget Waldorf shares how the idea of deeper relationships are what drew her to religious life and are what continue to sustain her.